98% of the survey respondents said they planned to fast the entire month of Ramadan. This percentage was consistent across Muslim majority OIC countries and non-OIC countries. This response shows a surprisingly high percentage of adherence to fasting, as it is commonly noted that other religious obligations throughout the year (e.g. five daily prayers) are not practiced consistently by all Muslims. On the one hand, the response reflects the importance Muslims give to the month of Ramadan and the ritual of fasting. Conversely, this may also be reflective of survey response bias as those who voluntarily participate in the survey may be those who are actively practicing Islam. Given this response, it is safe to evaluate the rest of the responses as given by Muslims who fast during the month of Ramadan. Question: Do you intend to fast during the upcoming Ramadan? What were the most practiced activities during last Ramadan? From among select mandatory or recommended religious practices during Ramadan, the most common activity was offering the five daily prayers. 88% of respondents said they prayed the obligatory five daily prayers during the prior Ramadan. Around half of the respondents said they gave extra charity during Ramadan. Half of the respondents also said they read the Qur’an daily and about the same said they attended the extra nightly congregational prayers (Taraweeh) regularly. The activities that were least practiced were praying at least three daily prayers at a mosque (22%), donating Iftar to the poor once a week (17%), and performing I’tikaaf on the last ten nights of the month (13%). These responses highlight a high level of spiritual activity taken on by Muslims during Ramadan that are both personal and social or communal, evident by the fact that half of the Muslims increase their charitable giving during Ramadan. Question: Which of the following did you do during the last Ramadan? 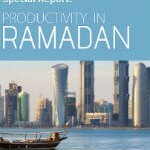 The majority of survey respondents (65%) felt they could have done much better spiritually during Ramadan 2010. Meanwhile, 17% were very disappointed with the quality of their spirituality. However, 18% were very satisfied with their efforts and are hopeful that Allah (Subhanahu wa Ta’ala ) would accept their deeds. Even having performed a high level of spiritual activity (see previous question), a high percentage of respondents wished they had done more during Ramadan. This can be inferred as not just a disappointment, but a desire to improve Ramadan spirituality in the future (i.e., striving for personal improvement, excellence in prayers, etc.). Question: How satisfied were you with your Ramadan spirituality from last year? The biggest challenge Muslims faced in observing Ramadan spiritual activities was their struggle to read the Qur’an regularly (66%). The second biggest challenge was “lack of focus during worship” (53%), closely followed by “not being able to attend Taraweeh prayers regularly” (47%). Other areas included praying regularly at a mosque, maintaining family responsibilities, being consistent in prayer, work inflexibility, and maintaining community responsibilities. The variety of challenges Muslims struggle with to improve their Ramadan spirituality, as shown in this response, reflects added pressure Muslims have during Ramadan. Question: What are your biggest challenges to develop spiritually during Ramadan?